Noah's Voyage I Can Read Adventure Bible is wonderful for young readers! I love that the sentences are simple and easy for the average 4-8 year old to read. The illustrations are beautiful and do a wonderful job in keeping young readers engaged in what they are reading. I like that the story tells about Noah's Voyage and teaches young readers of this wonderful story in the Bible. 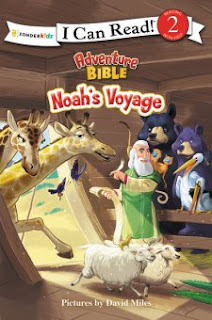 Both my five and seven year old were able to read Noah's Voyage I Can Read Adventure Bible with ease and really enjoyed reading it on their own. They liked all the animals included in the illustrations and enjoyed connecting the story to the illustrations. You can find Noah's Voyage I Can Read! / Adventure Bible on Amazon and other bookstores.